Just after midnight on March 09, 2019, Deputies along with Detectives with the Montgomery County Sheriff’s Office Homicide/Violent Crimes Unit responded to a “shots fired” call at a shopping center located at 25602 Interstate 45 North in Spring, TX. Deputies arrived to find one male subject shot multiple times. The victim was in front of his place of business when he was shot following a disturbance in the parking lot. He was subsequently transported to Memorial Hermann Hospital in critical condition and is currently recovering from his wounds. 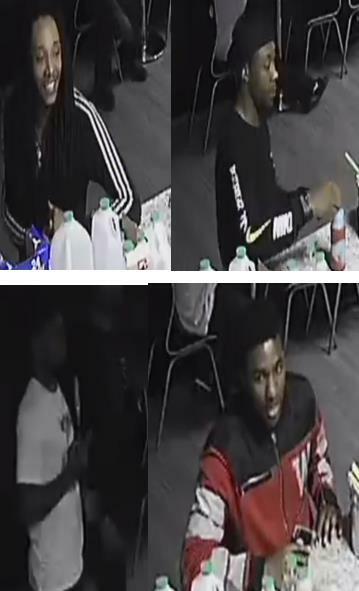 Detectives are seeking several persons of interest in the shooting obtained from surveillance footage of the Daquiri Lounge near where the shooting occurred. Please see attached photos for the four persons of interest. If you can provide any information to help investigators identify these persons of interest, please call the Montgomery County Sheriff’s Office at 936-760-5800 and refer to case number 19A079354. You can also call Multi-County Crime Stoppers at 1-800-392-STOP  and remain anonymous while possibly earning a cash reward.